Tai Tam Country Park is nestled in the eastern corner of Hong Kong Island. From Jardine's Lookout in the north, it sprawls across rolling slopes of The Twins to end at the southern border on Stanley Gap Road. The western border lies in Wong Nai Chung Gap, while Tai Tam Road marks its eastern boundary. Designated in 1977, the park occupies a total area if 1,315 hectares, or one fifth of Hong Kong Island's land area. There are 4 reservoirs in Tai Tam Country Park, all of them key water storage facilities of the Island in early years. Known as the Tai Tam Group, it comprises Tai Tam Upper Reservoir, Tai Tam Byewash Reservoir, Tai Tam Intermediate Reservoir and Tai Tam Tuk Reservoir. Built between 1889 and 1917, these reservoirs have an aggregate capacity of 9 million m3. Also in the park are remnants of war, such as forts, magazines and wartime communal stoves. Tai Tam was a bloody battleground during WWII. Here, the invading Japanese met strong resistance from the defending British troops. The adjacent Tai Tam Country Park (Quarry Bay Extension) is a smaller sanctuary designated in 1979. Lying on the northern edge of Tai Tam Country Park, this 270-hectare green country takes in Mount Parker and the north face of Mount Butler. 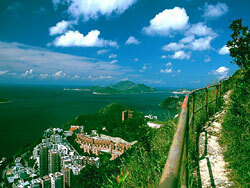 On the 530m summit of Mount Parker, you enjoy a sweeping view of Victoria Harbour. Conveniently placed near Quarry Bay and Sai Wan Ho, this country park is Eastern District residents' favourite choice for morning walk and other leisure activities. Blessed with ecological abundance and diversity, Tai Tam Valley is the gem of Tai Tam Country Park. This green pocket is set amidst sheer peaks : Violet Hill, Jardine's Lookout, Mount Butler and Mount Parker. All towering crests of more than 400 metres, with the highest Mount Parker rearing up some 507 metres, they are striking components of the beguiling Island landscape. From the uplands, rainwater flows down deep ravines to form meandering hill streams that nourish the vegetation. 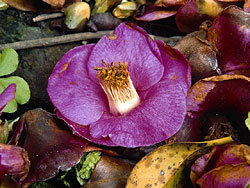 The rich diversity of Tai Tam Valley's flora and fauna is rivaled by very few places. Committed to protecting these natural treasures, the government named Tai Tam a Site of Special Scientific Interest (SSSI) in the 1970's. Thanks to this effort, Tai Tam Valley has not become a victim of modern development. 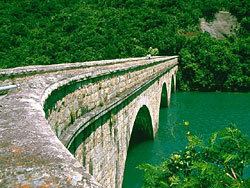 Its landscape, one of the best on the Island, has been faithfully preserved. 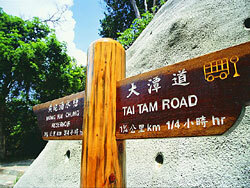 To see Tai Tam Valley, follow Stage 6 of the Hong Kong Trail which starts at Mount Parker Road. Make your way up Quarry Gap, and then descend along the southern slopes to an arcadia of woods, streams and lakes. The path that orbits around Tai Tam Reservoir is a very pleasant walk, cherishing a full view of the valley with her showcase of eye-catching greens. At Tai Tam Mound, a small path on the left runs northwards to the end of the trail on Tai Tam Road. The picturesque Tai Tam Valley harbours some interesting historical sites. One of them is the ruins of a bungalow on Jardine's Lookout. Once the residence of James Matheson, the original Scottish founder of Jardine Matheson & Co. Ltd., the bungalow is now reduced to a mere foundation. There are several picnic and barbecue areas in Tai Tam Country Park and Tai Tam Country Park (Quarry Bay Extension). Most of these facilities are located along Mount Parker Road and Tai Tam Reservoir Road and near Woodside. There are also a rain shelter and children's play facilities to cater to individual needs. For morning walkers, a morning walker garden can be found in Quarry Bay. Quarry Bay Jogging Trail is a 2,500m route that runs along Sir Cecil's Ride. Starting at Mount Parker Road in the north, it extends north to Braemar Hill in North Point. Near its northern end, a lookout offers a stunning panorama of eastern Hong Kong Island and Kowloon. To accommodate different levels of physical ability and varied interests, the Agriculture, Fisheries and Conservation Department has provided an assortment of walks and trails in Tai Tam Country Park : Tai Tam Country Trail, Tai Tam Tree Walk, Wong Nai Chung Tree Walk, Quarry Bay Jogging Trail, Quarry Bay Tree Walk and Hong Pak Country Trail. 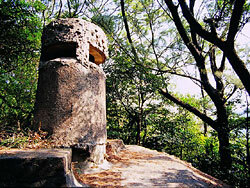 With most of its vegetation severely damaged during WWII, Tai Tam was a barren valley of denuded slopes a few decades ago. After the war, systematic reforestation work got underway to revive the badly eroded hills. The hard work has paid off, and today's Tai Tam is green and full of life. Most common tree species here are Taiwan Acacia (Acacia confusa) and Slash Pine (Pinus elliottii), which are highly tolerant to dry weather and strong wind. On the slopes and ravines you find natural shrubs, and flowering plants include Hong Kong Gordonia (Gordonia axillaris) that blossoms in winter and Rhododendrons that show their colours in spring. Other wild plants common in these parts are Common Melastoma (Melastoma candidum), White Popinac (Leucaena leucocephala), Miniature Umbrella Plant (Schefflera arboricola), Machilus species, Hong Kong Camellia (Cemellia hongkongensis) and several orchids. The dense woodlands on the two sides of Tai Tam Reservoir Road and the region south of Mount Parker are ideal habitats for native wild animals. Though seldom seen, the Common Muntjac (Munitacus muntjac) and Chinese Leopard Cat (Felis bengalensis) are often heard, while the Styan Squirrel (Calliosciurus erythraeus styani) that moves agilely from tree to tree, and others mammals, such as Chestnut Spiny Rat (Niviventer fulvescens), Chinese Porcupine (Hystrix brachyura), Chinese Ferret Badger (Melogale moschata) and Small Indian Civet (Viverricula indica) are common in the valley. Birds occurring here are Hwamei (Garrulax canorus), Magpie Robin (Copsychus saularis), Chinese Francolin (Francolinus pintadeanus), Japanese Quail (Coturnix japonica), Common Kingfisher (Alcedo atthis), Magpie (Pica pica), Crested Myna (Acridotheres cristatellus), crows, Japanese White-eye (Zosterops japonica), Black Kite (Milvus migrans), Tree Sparrow (Passer montanus), Chinese Bulbul (Pycnonotus sinensis), Yellow-crested Cockatoo (Cacatua sulphurea) and Collared Scops Owl (Otus bakkamoena). Many amphibians dwell along the hill streams. One examples is the Hong Kong Newt (Paramesotriton hongkongensis). Tai Tam is the only place on Hong Kong Island where this little creature can be found. Sharing this valley with the newt is the Romer's Tree Frog (Philautus romeri) which was transferred here from Lantau to make way for the Chek Lap Kok International Airport. Nocturnal amphibians distributed in Tai Tam include Asiatic Painted Frog (Kaloula pulchra pulchra) and Hong Kong's only true tree frog Brown Tree Frog (Polypedates megacephalus). 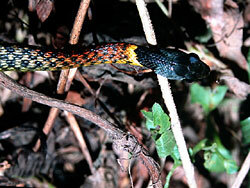 Reptiles found in Tai Tam are venomous snakes like Many-banded Krait (Bungarus multicinctus multicinctus), Chinese Cobra (Naja atra), Red-necked Keelback (Rhabdophis subminiatus helleri), and Changeable Lizard (Calotes versicolor). The valley is also rich in insects. Inhabitants include butterflies like Paris Peacock (Papilio paris), Indian Fritillary (Argyreus hyperbius hyperbius), Common Indian Crow (Euploea core amymone), Red Ring Skirt (Hestina assimilis assimilis) and Peacock Pansy (Junonia almana almana), as well as stick insects (Entoria sp. ), Tiny Brown Mantid (Spilomantis occipitalis), Blue Spotted Tiger Beetle (Cicindela separata), various species of dragonflies and damselflies. Spiders like Large Woodland Spider (Nephila Maculata) also occur in Tai Tam Valley. It is no coincidence that both the Hong Kong Trail and Wilson Trail pass by Jardine's Lookout in Tai Tam Country Park, for this high point offers the most beguiling view of Victoria Harbour. Stage 5 of the Hong Kong Trail begins at Wong Nai Chung Gap and conquers the 433 m Jardine's Lookout via the north embankment of Wong Nai Chung Reservoir and Parkview. Beyond the summit, the trail travels downhill for about 100 metres before continuing along the ridge. After a stone quarry, it trends up again for the 436 m Mount Butler. This is a challenging hike requiring considerable physical strength, but the open vistas at the top make it all worth while. Atop both spurs, the majestic landscape of Hong Kong Island unfolds before your eyes. From Jardine's Lookout and Mount Butler, a captivating contrast of city and nature bewitches you. To the north, you gaze across Victoria Harbour and Hong Kong's modern skyline. To the south are the emerald Tai Tam Group and wooded catchment area. For your unwilling departure, follow the path downhill to Quarry Gap which joins Mount Parker Road. Stage 1 and Stage 2 of the Wilson Trail cut right through Tai Tam Country Park and the Quarry Bay Extension. The first stage sets off in Stanley and advances to Wong Nai Chung Reservoir via The Twins and Violet Hill. There are dreamy seascapes to keep you company all the way, and abandoned war forts to remind you of the bitter past. Stage 2 shares the same starting point with Stage 5 of the Hong Kong Trail Wong Nai Chung Gap and the two routes overlap in some sections. After passing Jardine's Lookout and Mount Butler, the trail trends down to the north along the ridge between Mount Butler and Siu Ma Shan. At the end of the slope it joins Sir Cecil's Ride and the Quarry Bay Tree Walk. This route passes a site of wartime communal stoves. After Hong Pak Country Trail, you soon arrive at the finishing point in Quarry Bay.